Cats hate water, right? Well, not always. It's a complex arrangement, bordering on the ritualistic. My cats have a very interesting relationship with water. They’ll gladly drink out of my glass, but they won’t touch the nice fountain I got them. Sometimes I catch Thomas batting the top of the water in his dish. After I step out of the shower and before I start drying off, Bella pounds on the bathroom door until I let her in and allow her to rub herself all around my dripping-wet legs. 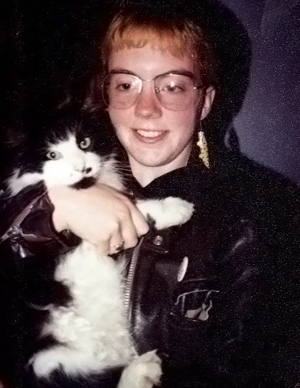 Once upon a time, I even had a cat who liked baths, which I found out when my mother commanded me to bathe him after he’d gotten filthy and stinky on one of his outdoor treks. Several of you have asked me about water-related cat behaviors, so today I’m going to examine my favorite weird cat-and-water habits. 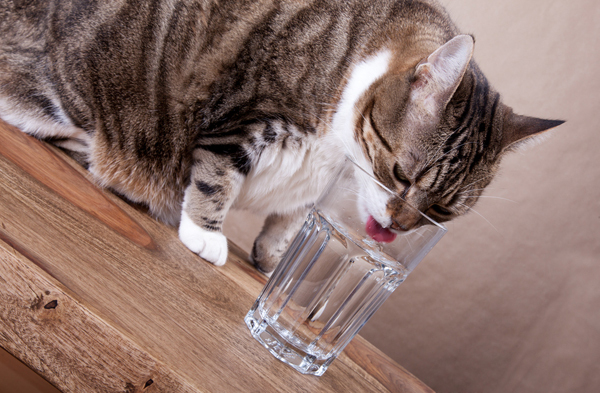 Most behaviorists say that when a cat drinks from his caretaker’s water glass, it means the water in his bowl is stale or too warm. 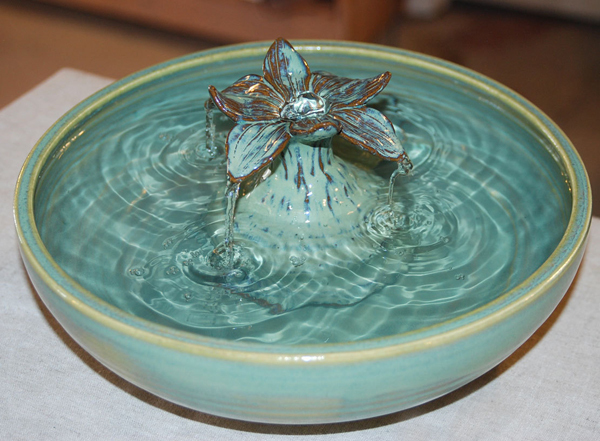 Try giving your cat’s bowl a good wash and rinse, and filling it with fresh water. Of course, if your cat is like my Siouxsie, it won’t matter whether you cleaned and refilled the water dish two seconds before, he’ll choose to drink from your water glass anyway. 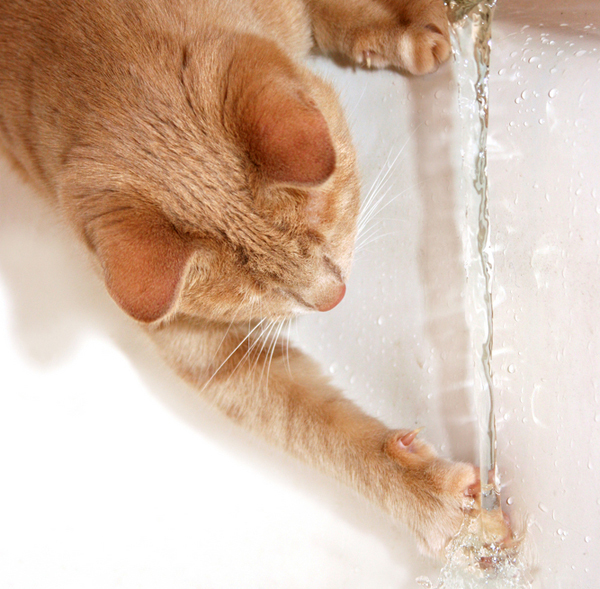 This behavior is generally thought to occur because instinct leads cats to prefer cool, flowing water. After all, flowing water is fresher than the stuff sitting in your cat’s dish. How can you resolve this behavior? Try investing in a pet drinking fountain. I’d recommend avoiding the ones made of plastic, though. Generally speaking, cats don’t like or need regular baths. They are very good at grooming themselves and have a pretty strong aversion to being plunked down in a basin of water. The exceptions are cats like the Sphynx, whose skin accumulates oils, and kitties who have trouble keeping themselves clean due to digestive problems or incontinence. 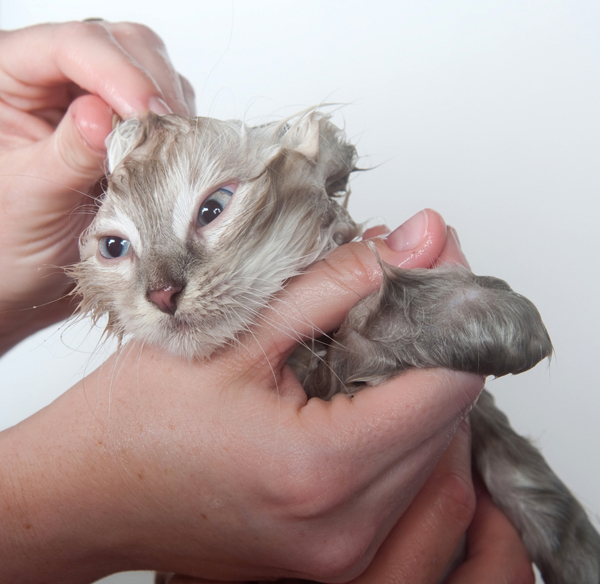 If you do need to bathe your cat, you might find these tips from Marci Kladnik helpful. Years ago, I got a letter from a reader of my cat advice blog, whose cat was making her crazy with his desire to splash all the water out of his bowl or tip it over so that his water ended up all over the floor. 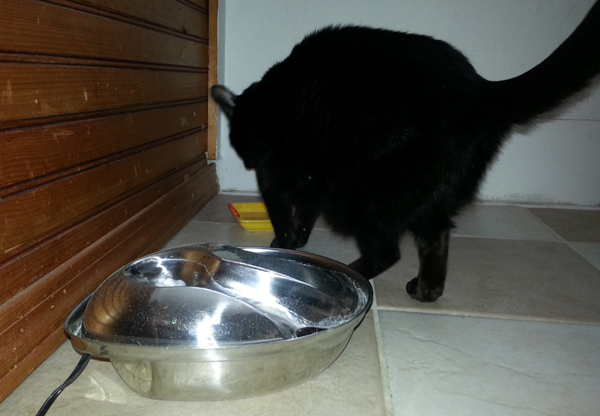 My advice: If your cat tips his water dish, get a bowl that’s wider on the bottom than on the top. If the dish isn’t clear, your cat might have an easier time finding the top of the water without tapping it with his paw. If kitty still finds a way to tip his dish, put it in a tray or a pie pan so the water doesn’t go everywhere. Believe it or not, some cats actually like to swim. Their distant cousins, the big cats, can often be seen swimming and wading, presumably to stave off the heat. Among domestic cats, the Turkish Van and Turkish Angora are well-known for their love of water — although nobody knows for sure how they got that way. Do you have a cat who swims? A cat who likes to join you in the shower? Or maybe your cat has some other odd water-related behavior? Please share your stories (and photos of them caught in the act, if you can) in the comments!